I am down another .5 pounds putting total weight loss at 9.5 pounds. I am extremely sleepy. I am sleeping 7 hours a night which is alot for me. Also, i go go go all day, then suddenly with almost no warning, my body says “time to shut off”, and it does. I got hungry earlier today, and again did almost no snacking. I had a green smoothie of banana, strawberry, spinach, vitamineral green, and sun warrior protein powder. As soon as mom woke up, that is what she asked for. I made a late lunch of hummus and veggies to dip or just eat as well as using the last couple leather breads from my visit with Patti the raw guru. I put some hummus on the bread along with some cashew butter, tomato, and avocado. Really yum. The bread grows on me every time. The first bite i have it is ok The second, it is good. By the 4th, i love it. By the end, i wish i had another sandwich. For dinner, i thinly chopped veggies and served with them hummus and long romaine leaves sliced in half. 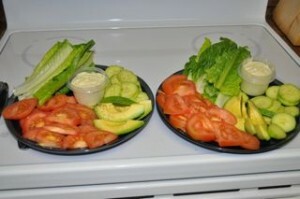 each person was then able to paint their romaine leaves with hummus and top with their veggies. I loved this! So much, we are having it again tomorrow. Also, on the food side, when we first started. Each person was having about 2 avocados a day and people wanted a 3rd. Now, people seem satisfied with 1 a day or 1 and a half a day. Well i am exhausted and off to bed. Lindsay, our resident omnivore is up next to tell you about her day. I think I spoke to soon when I said my detox had run it’s course. I felt like crap most of the day and had very little focus, right now included. Lunch was good. I had a veggie plate consisting of broccoli and carrots with humus, avocado, red bell pepper, and tomato. For desert I had part of nut/chocolate bar that Patti had given us to try. It was freakin’ tasty. My stomach was finicky for the latter part of the day and I got hit with this massive craving for Chipotle. The weird part though is that even if I had Chipotle, I’m not sure how it would settle with my stomach. Today, I caved and used some hand lotion. I had been trying not to, but bleeding knuckles and pain, tend to make good causes for reconsideration. I think I need to go put myself to bed and hopefully I’ll feel better in the morning. Two guys walked into a bar…the third one ducked. 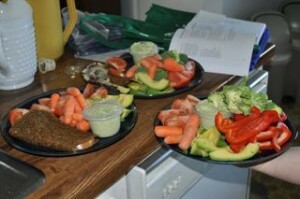 This entry was posted on Friday, March 13th, 2009 at 11:57 am	and is filed under Raw Food. You can follow any responses to this entry through the RSS 2.0 feed. You can leave a response, or trackback from your own site.